This estate caughtmy eye on a very cold early afternoon in December. Those were the last rays of 2010 before the days got too short to take pictures. I made the most of it that afternoon. Love the colours here! 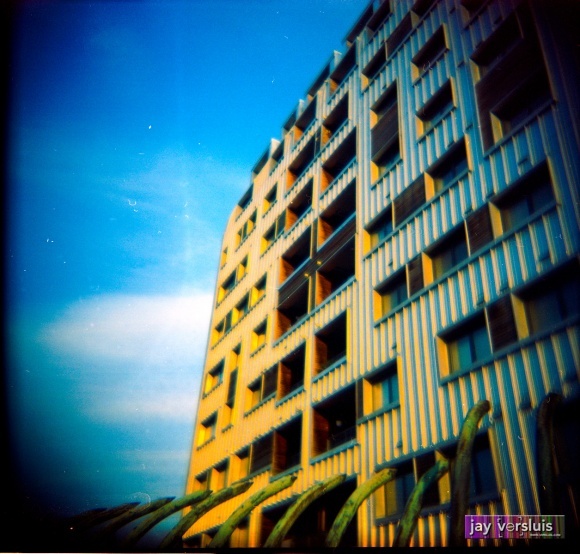 The Portra works great in Holga’s! thanks for your comment, and thanks for following me. I love Portra for those super saturated colours. I develop it myself and usually push it by a stop or two to get this characteristic. I’ll check out your site – sounds interesting! I couldn’t agree more 😉 Add some good sunlight to it and no matter what you take a picture of looks great. I’m interested to see what the new Kodak Portra will look like – even though I’m not too comfortable to have the VC removed… it was painful to lose the UC already! Here’s hoping strong saturation will still be part of the new Portra.